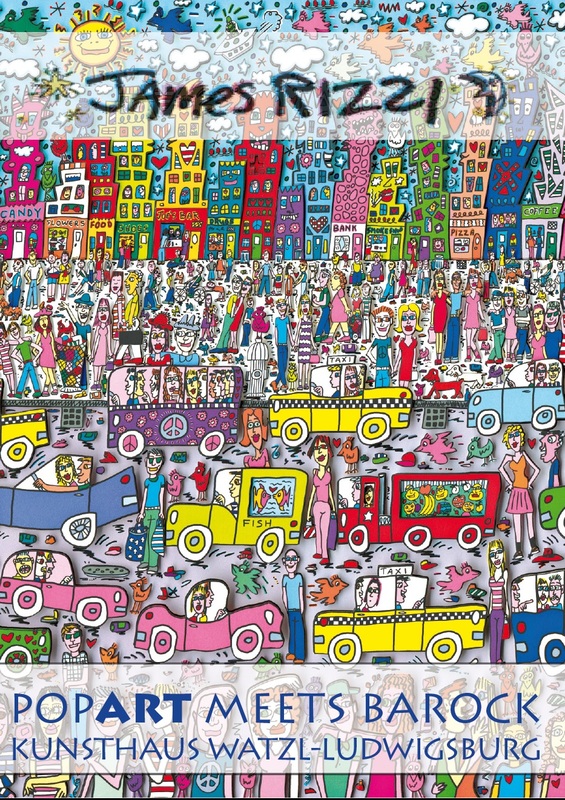 James Rizzi was during his lifetime one of the most popular artist, a real „Pop Artist“. He became famous through his invention of the 3D-construction on paper and the 3D-magnetic objects. Since the 1970s those inventions are always connected with his art. After he died in 20111 the requests for his art work exploded enormous. The exhibition starts with the opening on Wendesday 24.6.2015 at 7p.m.. We are glad to present the artist in Göttingen at gallery Nottbohm and welcome all guests and friends cordially to this special event. 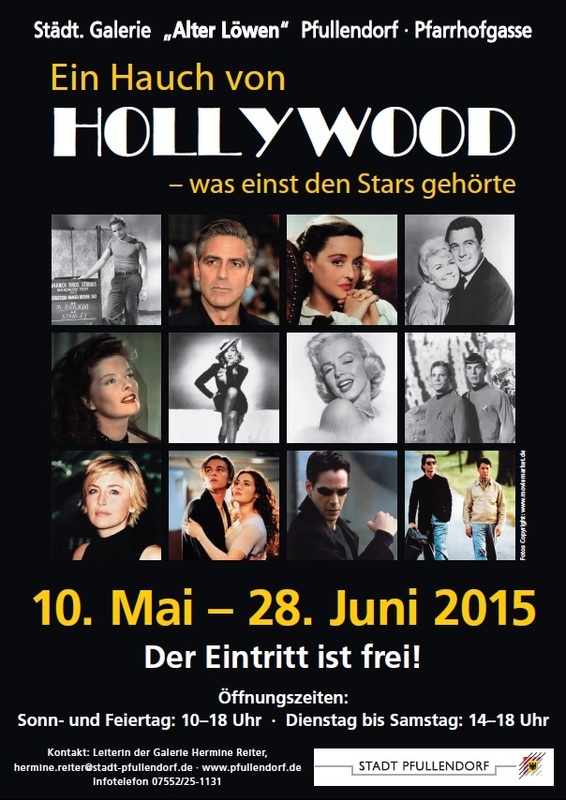 Part of the exhibition “The spirit of Hollywood” in the gallery of the city Pfullendorf are american icons and stars. 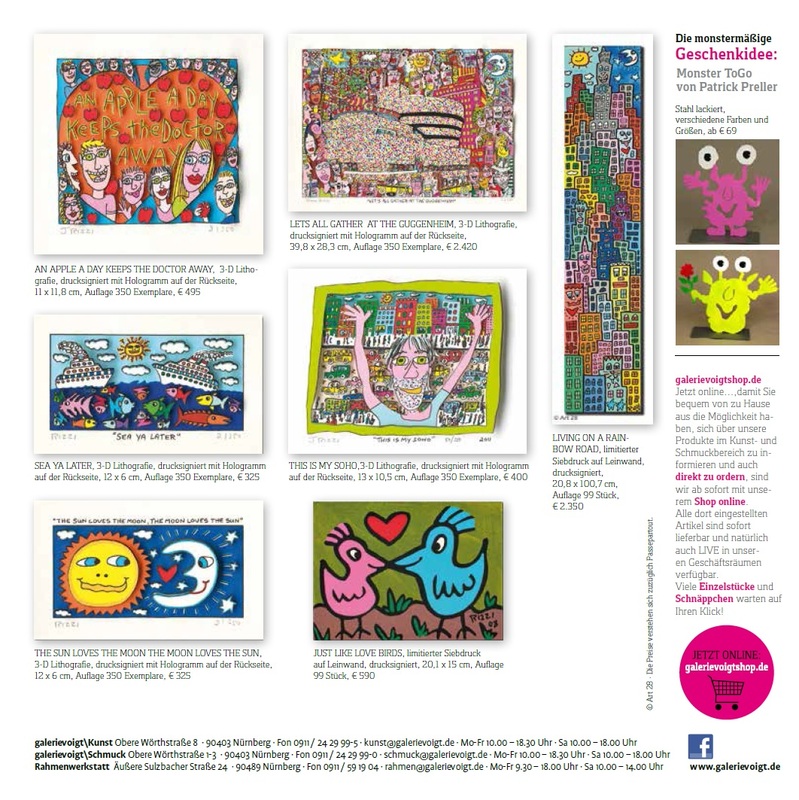 Also artworks of the pop art icon James Rizzi are presented in the ground floor of the historic building in Pfullendorf. There you will find the museum shop with lots of interesting articles, books and art work for art lovers and fans. The actual 3D series of James Rizzi can be seen in the shop. Visit the museum until June 28th. James Rizzi always enjoyed his stays in Wiesbaden. He liked the region Rheingau vermuch, but also the Art Gallery in the centre of Wiesbaden. The gallery showed his art work for many years now. Also 2015 the gallery exhibits Rizzis most beautiful art works. Some highlights are the personal objects of Rizzi and objects in Rizzi design. 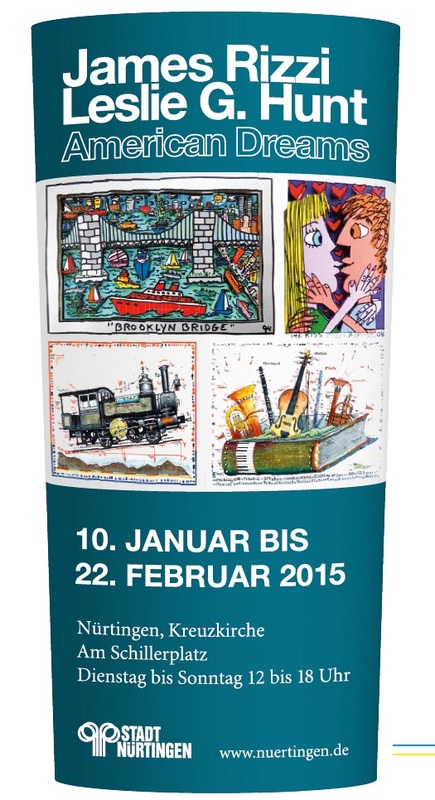 Visit the exhibition on March 21st in 2015 and admire the artits´s amazing art. 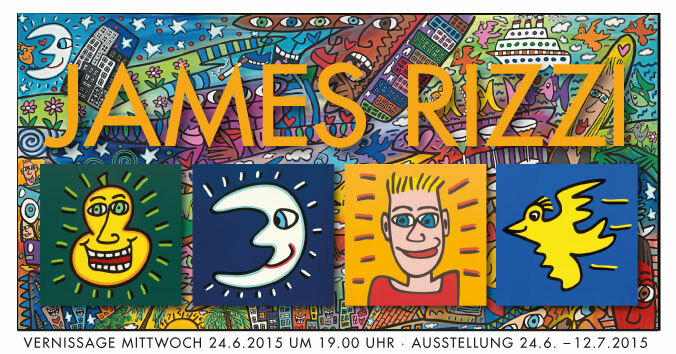 The Gallery Art Box Berlin is presenting the artist James Rizzi at the Art Karlsruhe 2015. At the booth the gallery presents all guests the famous editions of the New York artist. Discover some new editions, but also rare highlights from the early beginning of Rizzis carrer. The famous 3D art works of James Rizzi are placed in hall 1 booth T03. 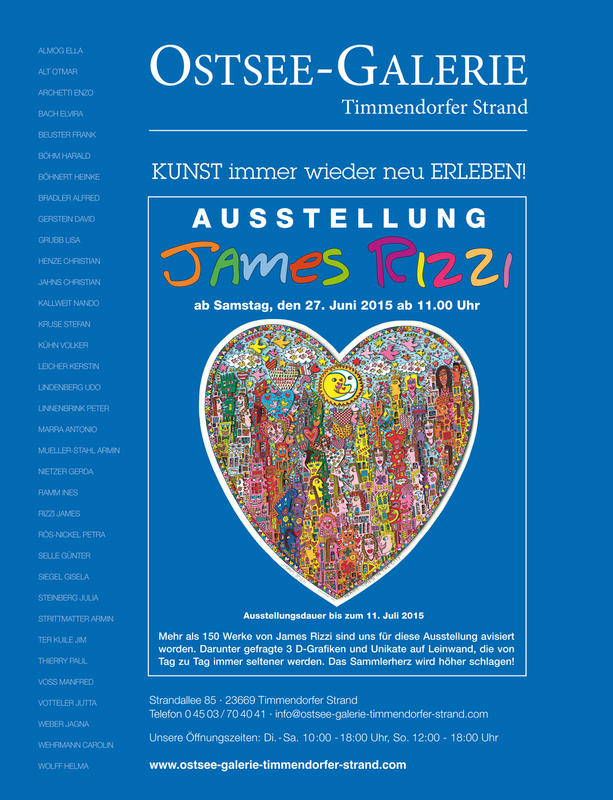 2015 the KUNSTHAUS WATZL in Ludwigsburg presents on 2 floors the very first exhibition of the famous POPART performer JAMES RIZZI in the Barock City Ludwigsburg. In the church of the Dominican in Muenster Westfalia Rizzi will be presented in a great show. The exhibition starts on January 23rd until February 22nd. Gallery Hunold is organizing the exhibition. There will be a lot to discover from the pop art of the New Yorker artist. Opening hours: daily 12 to 7 p.m. Further information on the website of Galerie Hunold. James Rizzi is known for his colourful, bold but also childish and naiv images. His worls is unique in the worls of pop art. Also he is the inventor of the 3D sculptures in paper and is popular all over the world with a huge fan community. Many techniques and materials have been focused by the artist with the famous coloured themes –sneakers, buildings, cars and even planes. 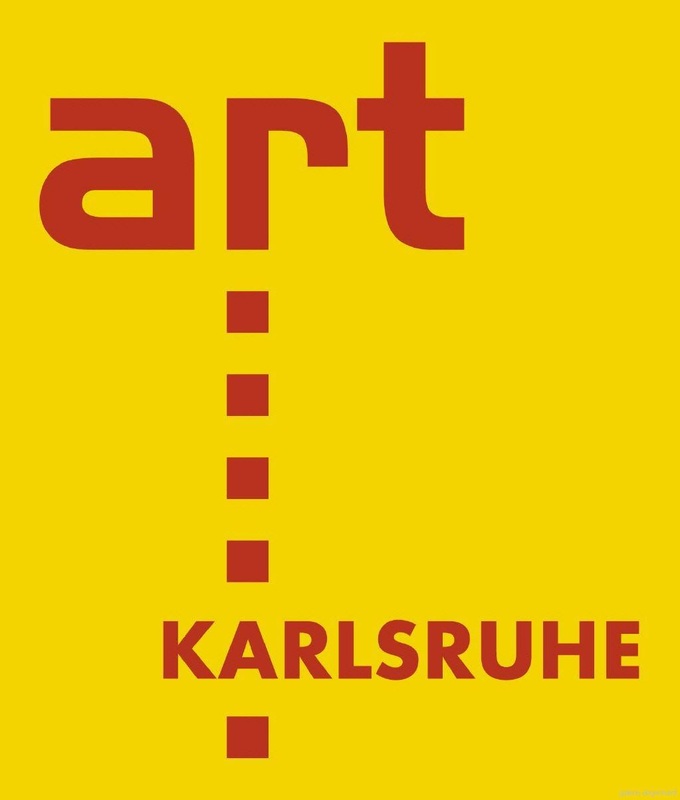 More than 300 3D sculptures can be admired in the Stadthaus „Alter Bahnhof“ in Traben-Trarbach in Traben. During this exhibition a big program for childrens and youth will bring this fantastic modern art into their world. Rizzis world is art for everybody. James Rizzi is one of the most popular artist in our times, a real Pop Artist, famous for his unforgetable paintings, creations and his 3D art works in paper. Rizzi is one of our famous guests in the gallery Voigt. A few time he visited the gallery and the fans in Nürnberg. Ewen if he cannot join us today, his spirit will be in our hearts forever.